Ok. I like eggs. I really do. Give me a spinach and feta fritata and I’m a happy girl. Eggs Benedict – even better. “I am frightened of tempering eggs.” That’s it! To answer your questions: NO – I had no freaking idea what I was doing. It was just a shot in the dark, and lucky for me, it worked! Truth be told, I really would have loved it if someone had given me advice on tempering eggs before I attempted that feat. As you all know, this is a “live blog” in other words, I blog as I make the ice cream. If I screw up or the flavor is gross, well, so be it! You’re going to have to read about it, and even worse, I’m going to have to eat it. Lucky for me, there’s only been one tragedy at 365 scoops. Hopefully not too many more will come my way! Being that this is, however, a live blog, I didn’t do much research on tempering eggs – I really just dove in head first and hoped for the best. Perhaps that’s my mantra in life! Here are some things I wished I had known about tempering eggs before my first try. I hope they’re helpful to you. Whisk the heck out of the egg yolks. 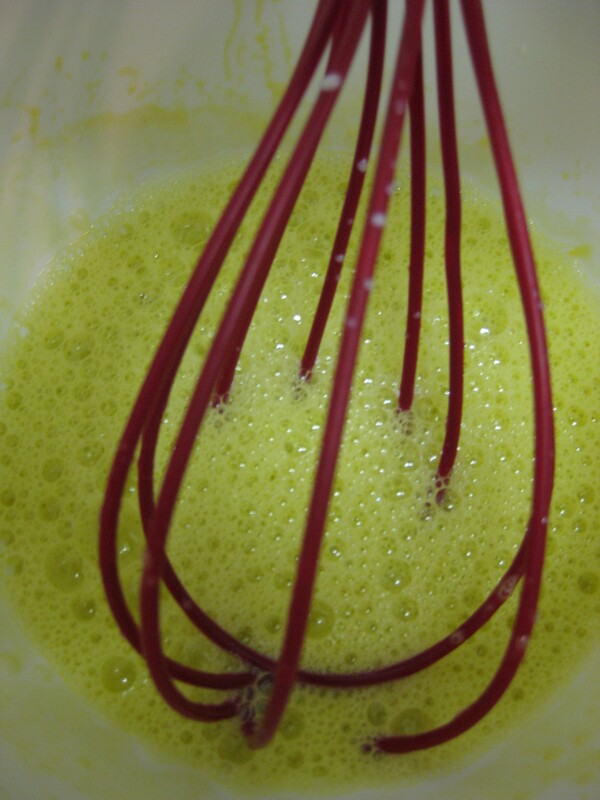 And just when you think you’ve whisked enough, whisk some more. The creamier and frothier the better. Essentially, tempering eggs is slowly raising the temperature of your egg yolks up to the temperature of a hot liquid you have on the stove. This serves the purpose of preventing the yolks from turning into scrambled eggs if you simply dump them in. To quote The St. Louis friend in her recent post, make sure to temper the eggs nice and slowly or else “they will throw a temper tantrum” and scramble. I love this! This whole post probably begs the question: why eggs in ice cream anyways? To be frank, I often wonder the same thing myself. And to be even more frank (is this confessional or something?) I prefer my ice cream without eggs! But, there are some of you who really do like the added creaminess that egg yolks undoubtedly provide, so that’s why I am committed to trying recipes with eggs. David Lebovitz gives an excellent explanation of the difference ice cream made with and without egg yolks. I feel compelled to share it with you so that you are fully informed readers. There are two basic types of ice cream: French-style which is a cooked custard made with egg yolks, and Philadelphia-style which is made with cream or milk, but no eggs. French-style ice creams tend to be smoother and silkier due to the emulsifying power of the egg yolks, which get cooked on the stove top (hello tempering!). Philadelphia -style ice creams can be simply mixed or pureed, thoroughly cooled, and then churned (i.e. much simpler!). Because Philadelphia-style ice creams don’t have egg yolks they tend to be a little firmer, freeze harder, and have a somewhat chewier texture (note: I have no idea what David is talking about here!). The advantage, of course, is that Philadelphia-style ice creams have no egg yolks so they’re a little lighter tasting and easier to make. My only problem with this post is that you called Alfred Hitchcock “a nut”. You know he is my all-time favorite. Other than that…..looks good! Can’t wait to read more…. Chocolate with chocolate covered pretzels. Are you trying to kill us?! THIS STUFF IS AMAZING. The chocolate ice cream itself is delicious and then there’s a CHOCOLATE COVERED PRETZEL SURPRISE. i can’t wait for tomorrow batch! ;) signing up for a gym membership last week all makes sense now. The ice cream is stand-alone awesome with a nice balance of tasting rich but actually being rather light. My favorite part, though, was the pretzel surprise! There’s nothing I like more than pretzel and chocolate, and I loved that you didn’t skimp on the pretzel AT ALL! Happy eating to you both!